Last week we were back in the UAE for the biggest and the most important technology event in MENA & South Asia. 38th GITEX Technology week took place from October, 14th till October, 18th in Dubai. According to the Dubai World Trade Centre which organized the event, there were more than 5.000 exhibitors and 100.000 technology experts from 120 countries at GITEX. The main topics of the event were artificial intelligence, blockchain, robotics, 5G, cloud, virtual and augmented reality. There were 24 exhibiting zones where companies showcased practical application of emerging technology. Some of them focused on global smart cities, artificial intelligence, internet of things, smart workplace, smart home, blockchain, future transportation, cyber security, cloud and future tech. GITEX hosted top-notch experts from some of the biggest companies in the industry, such as Amazon, Google, Twitter, Alibaba, Microsoft and Huawei. Some of the biggest attractions at the tech week were self-driving cars, mobile police station and robots. Cyborgs called Melvin and Sophia entertained visitors with their witty responses. Basketball robot shot like LeBron. Some robots acted as receptionists, tour guides and medical assistants. One of the robots even joined the Dubai Police as a security guard at the Dubai Mall. 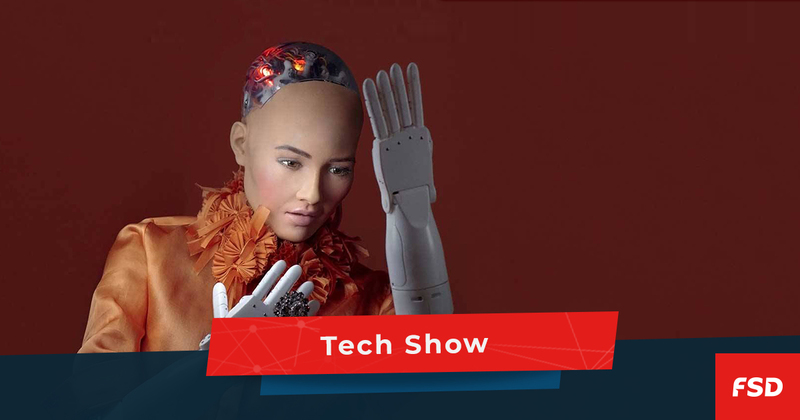 If you want to know what Sophia, the world-famous humanoid robot, thinks about the latest GITEX, 5G and what she enjoys about Dubai watch the video below. The event highlighted improvements in digital transformation, communication and biotechnologies. They transformed the way people interact with each other and shaped the future trends in the industry. Tech innovations can enhance the human, economic and cultural development of the world, both individually and collectively.